It was a long day at County Center last Thursday. There was a regular Hillsborough County commission meeting during the day and the first county budget public hearing regarding FY2017 budget in the evening. We want to thank Commissioner Murman for leading the effort to fund transportation within our existing budget. Without Murman championing her plan for a dedicated and committed transportation funding source using our growth revenues, we would still have no transportation funding. Murman's leadership, together with strong support from Commissioner White got us to where we are today. Finally, the county is using our existing budget to fund our roads and transportation needs. We've been requesting they do that for years as our revenues have been going up and up and up. While Murman's proposal got substantially changed, the end result is a victory for the taxpayers of Hillsborough County. At the June 9th sales tax hike public hearing, the commissioners agreed to pursue Murman's transportation funding proposal to dedicate and commit at least a third of our new growth revenues to transportation. They had also agreed to appoint a citizens committee to review Murman's proposal and that effort somehow vanished into thin air. We previously posted here that the commissioners discussed Murman's proposed ordinance for a TIF like concept that would provide a dedicated funding source for transportation at the August 10th Transportation Workshop. Commissioner Higginbotham led the effort at that meeting for the Board's decision to bring Murman's proposal back to the Board in the form of a Board policy rather than an Ordinance. That was already a compromise that took some teeth out of Murman's proposal because a Board policy does not have the same discipline of enforcement that an Ordinance has. Therefore, Murman asked for the Board policy language be brought to the next BOCC meeting scheduled a week away on August 17th. The Ordinance language had already been drafted by the County Attorney's office. It was astounding to hear County Attorney Chip Fletcher say he could not reformat the Ordinance language into a Board policy format in time to bring it back to the commissioners at their very next BOCC meeting on the 17th. It is beyond belief that Fletcher's County Attorney's office could not reformat Ordinance language already drafted into Board policy format in a week. The size of staff at the County Attorney's office is huge. They are so big that they farm out their resources and county legal services to other organizations - a post for another day. Therefore, Murman's transportation funding proposal as a Board policy would have to be addressed at the following BOCC meeting not scheduled until after the Labor Day Weekend on September 8, 2016. September 8th coincidentally was the same day as the first evening budget public hearing was scheduled. Either the public hearing should have been delayed or the BOCC meeting conducted the day before on Wednesday which is its normal meeting day. Making big budget decisions hours before a budget public hearing is again poor Governance by the County, especially when it could have been handled differently. Once we heard Fletcher make his statement forcing the delay, we knew the fix was in. Unelected bureaucrat County Administrator Mike Merrill, who has no policy making authority, clearly displayed his annoyance of Murman's proposal at the August 10th meeting. It was clear he opposed Murman's plan. How dare the county commissioners, who are elected to make policy and provide oversight for the county budget, take control of any part of the budget away from our unelected County Mayor??? What we anticipated played out and it was perfectly orchestrated behind the green curtain. The choreography, which probably began after the June sales tax hike public hearing, concluded with Higginbotham's plan suddenly thrown out just prior to the Labor Day weekend. The public, of course, was already focused on the long holiday weekend. We were able to get a copy of the plan on Tuesday, after Labor Day, from Commissioner Higginbotham's office. The plan can be found by clicking on the F-1 blue hyperlink on the online agenda (if you have your browser preferences setup appropriately) or the plan can be found here. There was barely time for anyone to digest Higginbotham's plan. Why was this change done at the eleventh hour and the same day as the first budget public hearing? Higginbotham's proposal substantially changed Murman's proposal and we will address the changes in another post. It greatly reduces the amount of our growing existing budget that will go to transportation over the next 10 years and does not provide a dedicated funding source. It does not address limiting the size and scope of county government to continue growing and growing AGAIN as our revenues climb. This is the predicament the county put themselves in prior to the recession. Transportation is the #1 issue in our county. The county spent over 3 years and $1.35 million of our county tax dollars telling us that. It is unfortunate that this Board once again refuses to commit a dedicated funding source from our revenue growth for transportation. 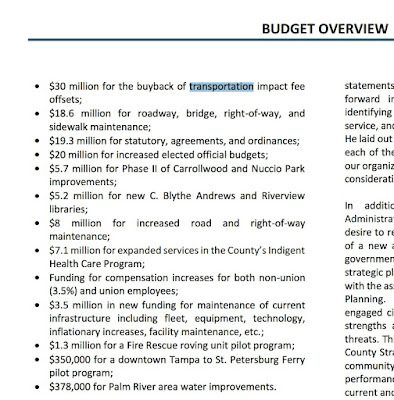 Higginbotham's plan will increase transportation spending in FY2017 by $35 million. But what are the taxpayers getting for that? At the public hearing the same evening, we found out. $30 million of our entire FY2017 transportation spending is going to developers for impact fee buyback credits NOT transportation projects. 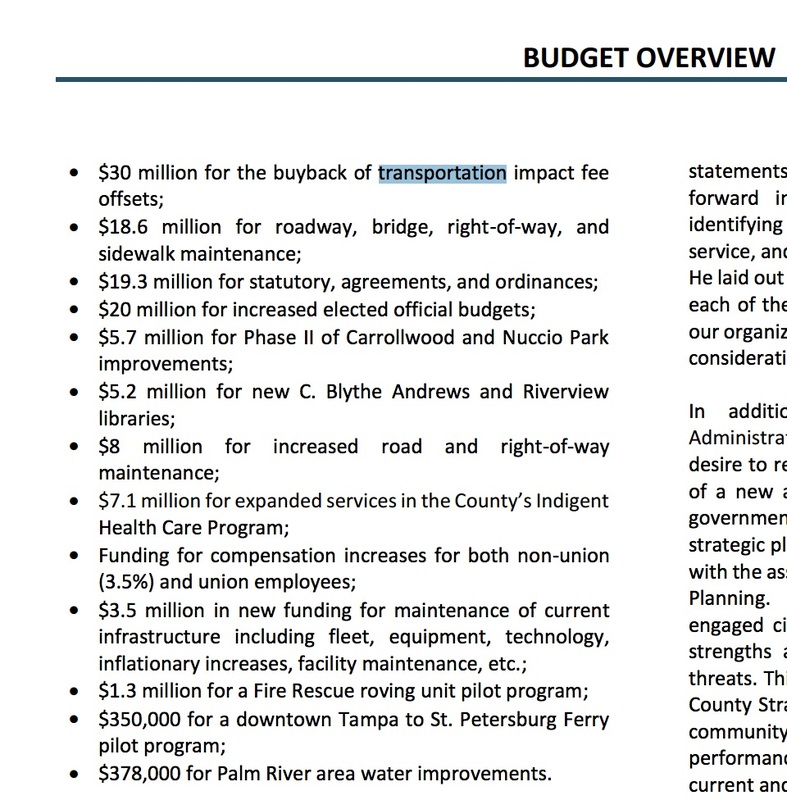 On page 28 of the Recommended FY2017 budget is the Budget Overview and the very top item is the impact fee buyback. This is outrageous. Who can defend that impact fee buyback credits should be included as part of our transportation spending? Especially when the county has neglected our roads for years. The county should not be spending our tax dollars on an impact fee credit buyback program to begin with. If there is a truly a market for impact fee credits, than let the free marketplace handle it - not our tax dollars. Sensing there is a public backlash to this buyback program benefiting developers, the commissioners asked county staff at the August 10th Transportation Workshop to go back and find another way to fund these buyback credits. That request vanished into thin air too. Merrill builds a huge amount of slack into our county budget each year. He could have found the funds necessary somewhere else if this program is so important but he did not. We're left assuming that the slack slush fund must be available for other things - pork projects, subsidies and handouts when needed - instead of funding a primary responsibility of county government, our roads and transportation. Taxpayers did get a Victory last week and we would not be where we are now without Commissioner Murman leading the way, but there is tons of room for improvements. And the first improvement must be to remove the $30 million going to impact fee buyback credits from the FY2017 transportation budget. That $30 million must fund much needed "real" transportation projects. This is a no brainer if the commissioners are truly serious about funding transportation NOW.